At one point in the XY era, there was a series of Special Energy coming out centered around each Type in the game. Each one would have a special theme to them, but none were as competitively viable as the almighty Strong Energy. A quick review: Herbal helped heal Grass Pokemon, Mystery helped Psychic Pokemon Retreat better, Shield helped Metal Pokemon tank more damage, Wonder helped stop extra effects on Fairy Pokemon, Flash removed the Weakness from Lightning Pokemon, Dangerous gave Dark Pokemon a counter of sorts, Burning helped with Fire Pokemon’s tendency to discard Energy, and Splash helped you add Water Pokemon back to your hand. Compare all of that to Strong Energy, which let Fighting Pokemon deal more damage, and already you can see why almost none of them saw play. Strong Energy was just so good a card, that for the better part of the last 2-3 years, most Fighting Pokemon have had their damage output lower than usual as a means of compensating for the fact that Strong Energy could make them so powerful. There’s a reason it topped the Furious Fists Top 10 way back in the day, and it still remains to this day one of the strongest – if not the strongest – Special Energy ever printed. Arora Notealus: I imagine that a lot of Fighting decks that aren’t Buzzwole-GX will end up getting pushed to the side without Strong Energy, though I also imagine Buzzwole-GX will somehow persist through this. I wonder if there’s a secret to it. Side Review: Crasher Wake – not necessarily a must-run, but it’s a big boon to Water decks in need of searching out cards that can afford to spend the extra energy. Mainly it’s a matter of finding the right synergy in your Water deck, and with some of the cards rotating out, Crasher Wake looks like a good option for Water decks, even if they did lose a couple other tools. Metal Frying Pan – great for Metal decks, but the removal of the Fire Weakness remains superfluous in the face of little Fire decks. The damage reduction though is quite significant, and I wouldn’t be surprised if Metal decks at least put this in as a tech. Otherwise, it’s not that big of a card to use unless your Metal Pokemon can threaten with a lot of damage – makes it more of a priority for your opponent to get rid of it. Alolan Exeggutor – not exactly competitive, but I imagine in Expanded that the inclusion of Battle Compressor makes him much easier to use. If Standard gets something like that again, it’ll be a nice way to open up different combos again. In the meantime, Alolan Exeggutor will have to settle for his Standard deck being a little weaker in certain aspects. Next Time: Time to call up everyone’s favorite storage professor for one last hurrah! Strong Energy has been with us, first released in XY Furious Fists and getting a second print in XY Fates Collide, which allowed Strong Energy to stay in Standard for roughly four years! It made in the top 10 cards of XY Furious Fists topping it (https://www.pojo.com/COTD/2014/Sep/11.shtml) and top 10 cards of 2014 (https://www.pojo.com/COTD/2014/Dec/19.shtml). Why does it rank so high? This is a Special Energy card that can only be attached to a Fighting Pokemon. It provides one Fighting Energy as well as boosting damage output by 20 before applying weakness and resistance. If you have four of them, that’s 80 more damage you can deal! Damage boosting cards tend to see a lot of play because they enable an attacker to reach important numbers to secure the OHKO or 2HKO. Depending on the base damage if said Pokemon’s attacks, if they still can’t reach a certain threshold, then it becomes a card that’s great to have for the rest of the game. That is, until said Pokemon gets eventually KOed or gets their attachment removed via Field Blower and/or Enhanced Hammer. With Strong Energy retiring to Expanded, we will have another damage boosting special energy card in the form of Beast Energy Prism Star. Like Strong Energy, it is deck specific: Strong Energy is for a Fighting decks while Beast Energy is for decks with Ultra Beast. Buzzwole-GX would still be monstrous even without Strong Energy. But that’s another story for another time! For Limited, regardless of expansion, if you pull this and have other great Fighting Pokemon to use like Lucario-EX or Zygarde-EX, definitely run this. Conclusion: I only gave it a four out of five because Strong Energy supports only Fighting Pokemon, meaning it isn’t a card that is used in every deck outside of Fighting decks. Specialized cards that is great for one deck and useless on others can elevate itself into “great” status and no higher than that. Strong Energy (FCO 115) has been a staple in the Standard format since August of 2014 when it came out in the Furious Fists expansion set. It really has seen its highest amount of popularity, however, just in the last eight months or so since Buzzwole GX came on the scene. Since then, Strong Energy has increased in usage so much so that, between May 18 and June 23, it surpassed Double Colorless Energy as the most commonly played special energy card. In fact, Strong Energy accounted for 46% of all Special Energy cards, 13% more than DCE. It was the twelfth most common card overall and could be found in 53% of the decklists I have from that time period. Considering Fighting Energy was run in only 48% of the decklists in that time frame, that gives you an idea of how significant this card is. When I first started playing Pokemon a little more than two years ago, one of my favorite decks was a Garchomp BKP Gallade BKT deck. Korrina FF and Teammates PRC really made that deck work, and I came to love Strong Energy and the twenty damage spif it provided. We haven’t had a whole lot of good Fighting Pokemon to really maximize the potential of this card… well until Buzzwole. That giant mosquito combined with Max Elixirs and Strong Energy to completely dominate the format. Strong Energy has been a huge factor in helping Buzz achieve its dominance (dominance it probably would have continued this past weekend at NAIC had some of the Buzz players actually chosen to be fundamentally sound and run Field Blowers in their decklists), and although Buzz will continue to be a Tier 1 deck post rotation, there’s no doubt in my mind that things are going to be just a little more difficult for the Protein Shake. No more turn 1 going second 70 damage KO’s of little Basics in the active position means that slightly slower decks might actually be able to keep up with Buzzwole and won’t fall behind in prize cards before they actually get to launch their first attack. And Diancie and Choice Band is only 210 damage for Knuckle Impact… oh wait that’s still enough to OHKO most Stage 1’s in the format, so maybe losing Strong Energy isn’t the end of the world for Buzz. Copies of Enhanced Hammer cards everywhere are very sad that Strong Energy will be leaving the format. Not sure what Buzz will do with those four card slots from losing Strong Energy… hmm maybe then they’ll start teching in Field Blowers? Out with an old timer, and its quite the old timer to be perfectly honest. It has served us players for a whopping 4 years in the Standard format, and now it is leaving the format where it cherished its old moments. 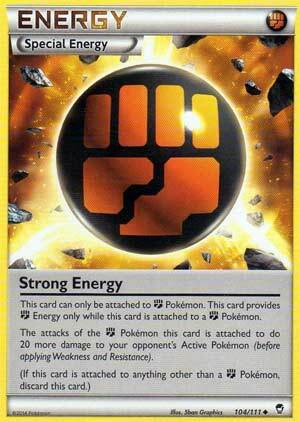 Strong Energy is a Special Energy card, one of the first to be designed for a specific type. It’s first released in the XY Furious Fists expansion of 2014, and then reprinted in XY Fates Collide in 2016. Both of these expansions have slight or heavy emphasis on fighting and Fighting type Pokemon in particular, and this should bring some light on what does this Special Energy do. This Special Energy is unique, as is with most of the unique Special Energy printed during the XY era, that it can only be attached to a Pokemon of a specific type, in this case Fighting. For each Strong Energy attached to a Fighting Pokemon, that Pokemon will get an extra 20 damage. Yes, a flat 20 extra bonus to only Fighting Pokemon, meaning that with enough Strong Energies attached they can become offensive juggernauts when left unchecked. This energy turns Fighting Pokemon, even the meekiest ones, into literal damage gods. The first applications of this energy is mostly onto Landorus-EX (BW BCR) where it saw immediate success, albeit for a short time because Landorus was about to entire Standard retirement. Then it moved on into decks such as Primal Groudon-EX (XY PRC) and Zygarde-EX (XY FCO) variants where it also saw success to help boost the raw damage of their otherwise unimpressive base damage. Then we enter the era of Buzzwole-GX (SM CRI) – and like Landorus before it, Strong Energy re-relived an era of golden meta core, making almost every Stage 2 Pokemon-GX deck unviable because of its sheer pressure and ease of usage paired with Brooklet Hill, Diancie Prism Star, Lycanroc-GX (SM GUR), Beast Ring, Beast Energy Prism and of course Special Charge to get them back into play. So what happened when Strong Energy has departed into the Expanded world only? Well, Buzzwole would lose some of its early game slaying potential. 50 and 60 HP basic Pokemon cards are drawn in a thinner line, and the former are not immediately shafted because they will “immediately die to a Jet Punch with a Strong Energy.” But its, in my opinion, for the best – more decks that are victims to Buzzwole-GX’s dominance, such as Gardevoir-GX, Magnezone decks and Metagross-GX might be able to make back the stand, and boosted by the loss of other, major player cards, the meta might return back to normal – or will it? Our collective ninth place pick for the Top Cards Lost To Rotation is Strong Energy (XY – Furious Fists 104/111; XY – Fates Collide 115/124), a Special Energy that states it can only be attached to [F] Pokémon, and as a clause which will discard itself should it find itself attached to a non-[F] Pokémon. Its effect also states it only provides [F] while attached to a [F] Type Pokémon, and also provides +20 damage to the attacks of the [F] Type Pokémon to which it is attached, before applying Weakness and Resistance. Other than the [C] Type, during the XY-era, every Pokémon Type received its own Special Energy cards which only worked for Pokémon of that Type. The effects of Strong Energy stack, two copies provides a total of [FF] and a +40 damage bonus. A few of these were all but useless, most had a few places where they worked, a few were good, and two were arguably TOO good: Double Dragon Energy and Strong Energy. We lost Double Dragon Energy last rotation, but Strong Energy received a reprint that kept it going for one more year… and what a year it has been. …but I think the best will still soldier on as their cores are intact. That might sound crazy, as Buzzwole-GX is going to have a hard time scoring those OHKO even against [F] Weak targets like it used to, which is true. It is important to remember all the cards everything is losing, like Professor Sycamore, but also the things that only certain decks will retain or gain. As an example, Buzzwole-GX loses so much but it’ll soon have Lisia, a Supporter that allows you to add two Prism Star cards from your deck to your hand. Why does that matter to Buzzwole-GX? This makes it quite reliable to get a Buzzwole-GX up and running with a Beast Energy [Prism Star] and a Diancie [Prism Star] early, early game. If you can still manage a Choice Band on top of this, Buzzwole-GX still OHKO’s a Zoroark-GX with “Jet Punch” thanks to Weakness. Which doesn’t mean Strong Energy wouldn’t have made it all even more potent. It would have, which is why I’m not sad to see it go; it is just a little too good, though the blame should be shared by several other facets of the game. Pace things better, and while +20 damage would still have made Strong Energy one of, if not the, best of the Type-specific Special Energy, the gap wouldn’t have been as large. Plus, some of its fellows were just flat-out underpowered, which isn’t its fault. Strong Energy finished in ninth place by appearing on two out of three of our individual Top 10 lists, and still making the Top 20 of the final list (yes, we all submitted extra-large lists this time). It earned 81 voting points, a good chunk of that coming from my own list where I had it as my sixth place pick. 9th place seems a bit low but even though I ranked it higher, I’ve got to admit that a good case can be made for everything that finished above it.